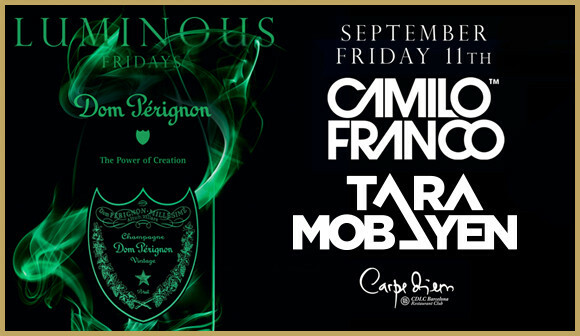 Tara Mobayen returns to Barcelona joining Camilo Franco on the decks at the city’s hottest club, CDLC! Tara will be showcasing her deep tech house sound. Barcelona, Spain – DJ Tara Mobayen played some of her 2016 tracks at CDLC Lounge Club, Barcelona with DJ Camilo Franco on September 11th. Stunning performances are what club goers expect at top club events such as CDLC Lounge Club’s Carpe Diem, but the crowd were wowed when they were treated to a special set from DJ Tara Mobayen, who shared the deckspace with DJ Camilo Franco on the night. She played several songs from her forthcoming double album Let’s Live! which will be available during 2016. Carpe Diem is best known as THE club for party goers who have a taste for luxury – Moroccan tables surrounded by plush cushioning and mouth watering food are nothing if not complemented by cool, crisp, Dom Perignon. The house specialty. Camilo Franco is well known in Spain. A Colombian, who settled in Barcelona and became a known face at clubs, fashion events and cinema events. Tara Mobayen is a similarly minded entrepreneur who has a keen interest in fashion. She has opened Toronto Fashion Week in the past and has had a successful modeling career of her own before taking to music and sweeping across India on tour when she’s not busy entertaining at Europe’s top nightlife destinations. The Tara Mobayen and Camilo Franco event at the prestigious CDLC in September was certainly a stylish one! Find out more about Tara Mobayen’s beats by clicking here to connect with her on Beatport https://pro.beatport.com/artist/miss-tara/395687, Soundclound https://soundcloud.com/misstaraofficial or by visiting her at the official Miss Tara website where you can see her chat and perform on video and indulge yourself in more news, more photos and even more videos of this talented artist. Fans can grab a big discount on her future releases, free access to secret parties and pre-sale concert tickets by joining the Miss Tara fan club.